While James did not specifically identify himself as to which “James” he was (James 1:1), the author is widely thought to be James the half-brother of Jesus. James was not a follower of Jesus during the Saviour's time on earth (Mark 3:21-35; John 7:5) but eventually became an apostle in the vein of Paul, as one who had seen and believed the Lord post-resurrection (1 Corinthians 15:7; Galatians 1:19). After witnessing the Lord's resurrected body, James became one of the leaders of the church at Jerusalem. Peter singled him out among the other Christians there following Peter's miraculous release from prison (Acts 12:17). James made the deciding speech at the Jerusalem Council (15:13-22), and Paul called James one of the pillars of the church (Galatians 2:9). As one of the chief leaders in the church at Jerusalem, James wrote from that city prior to the meeting of the Jerusalem Council, which Luke recorded in Acts 15. At that council, James, along with Peter and Paul, affirmed the decision to take the gospel message to the Gentiles. This council met in AD 49, meaning James likely wrote his letter in AD 45-48. Such a significant event as the Jerusalem Council warranted comment from James, as he was writing to a Jewish Christian audience. But James made no mention of Gentile Christians at all, making an early date for the letter most likely. In fact, it was likely the first New Testament book written. WHY IS JAMES SO IMPORTANT? The book of James looks a bit like the Old Testament book of Proverbs dressed up in New Testament clothes. Its consistent focus on practical action in the life of faith is reminiscent of the Wisdom Literature in the Old Testament, encouraging God's people to act like God's people. The pages of James are filled with direct commands to pursue a life of holiness. He makes no excuses for those who do not measure up. In the mind of this early church leader, Christians evidence their faith by walking in certain ways and not others. For James, a faith that does not produce real life change is a faith that is worthless (James 2:17). In the opening of his letter, James called himself a bond-servant of God, an appropriate name given the practical, servant-oriented emphasis of the book. 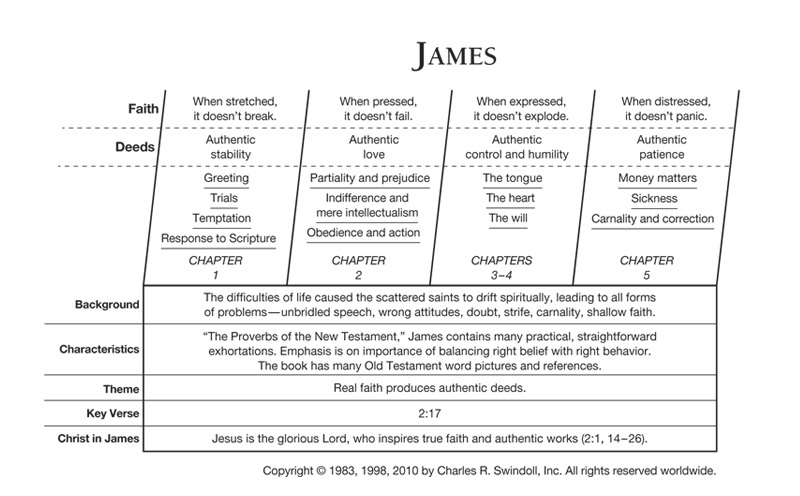 Throughout the book, James contended that faith produces authentic deeds. In other words, if those who call themselves God's people truly belong to Him, their lives will produce deeds or fruit. In language and themes that sound similar to Jesus' Sermon on the Mount, James rails against the hypocritical believer who says one thing but does another. For James, faith was no abstract proposition but had effects in the real world. James offered numerous practical examples to illustrate his point: faith endures in the midst of trials, calls on God for wisdom, bridles the tongue, sets aside wickedness, visits orphans and widows, and does not play favourites. He stressed that the life of faith is comprehensive, impacting every area of our lives and driving us to truly engage in the lives of other people in the world. While James recognized that even believers stumble (James 3:2), he also knew that faith should not co-exist with people who roll their eyes at the less fortunate, ignore the plight of others, or curse those in their paths. More than any other book in the New Testament, James places the spotlight on the necessity for believers to act in accordance with our faith. How well do your actions mirror the faith that you proclaim? This is a question that we all struggle to answer well. We would like to point to all the ways our faith and works overlap but too often see only gaps and crevices. As you read the letter from James, focus on those areas that he mentioned: your actions during trials, your treatment of those less fortunate, the way you speak and relate to others, and the role that money plays in how you live your life. Allow James to encourage you to do good, according to the faith you proclaim. Find resources in the book of James in our resource library.